Your patent, trademark and design portfolios (with live renewal statuses and patent / trademark / design info) are available online from any computer. Edit and delete patent / design records. View: a second layer of patent information automatically extracted from databases; a copy of the published patent document. View your patent “citing documents” at the click of a button. The inventions in these documents may infringe your patents. Add new patents, trademarks and designs at any time. Add up to two references to each annuity record. 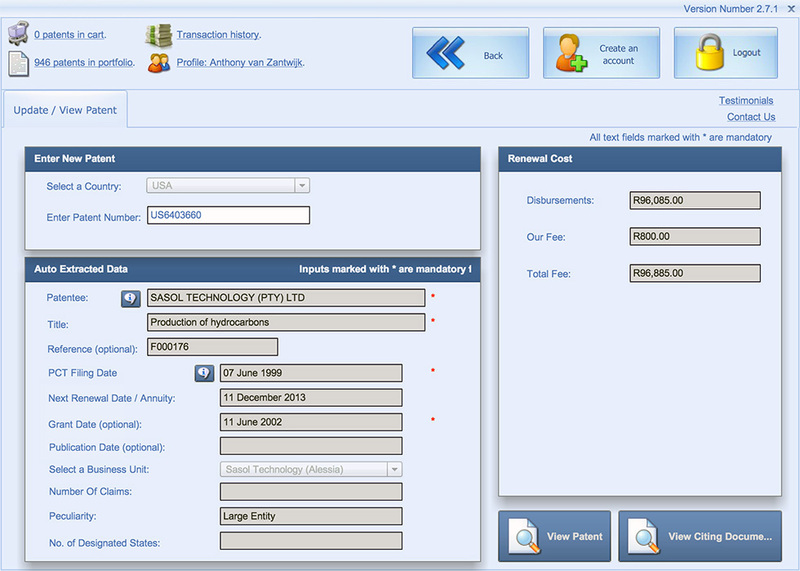 Search according to patent / trademark / design number, title, applicant, reference and business unit. Track the progress of renewals online. Review previous annuity / renewal instructions online. View and download renewal certificates online. Our system continuously tracks third party patents that may infringe patents in your portfolio, and sends you infringement alerts by email. Opposition alerts are also automatically generated for South African trademarks.